Estimated daily P intake (in mg/d) from daily protein intake (in g/d) in 107 MHD patients from the NIED Study (30). 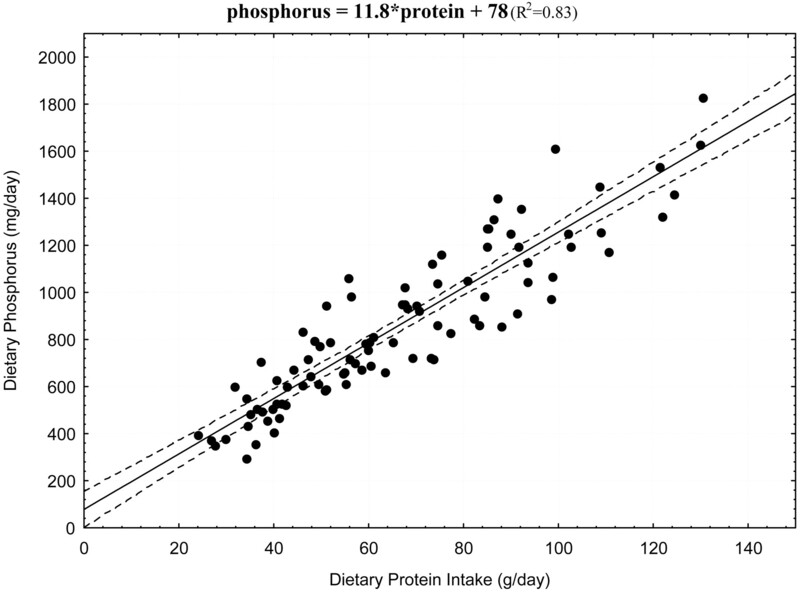 Regression equation: P = 11.8*protein + 78 (r = 0.91, P < 0.001). Characteristics of the study population: 107 adult MHD patients from eight DaVita dialysis Clinics in Los Angeles area, 2001–2006. Dietary P intake 874 ± 1352 mg/d (range 294 to 2137 mg/d), dietary protein intake 66.6 ± 26.9 g/d (range 24.1 to 160.7 g/d), age 56.0 ± 12.4 years, men 60%, black patients 43%, Hispanic patients 36%, patients with diabetes 62%, dialysis vintage 42.1 ± 33.7 months, postdialysis dry weight 75.1 ± 20.8 kg (range 42.6 to 172.1 kg), single-pool Kt/V 1.58 ± 0.28. Dashed lines indicate predicated interval. 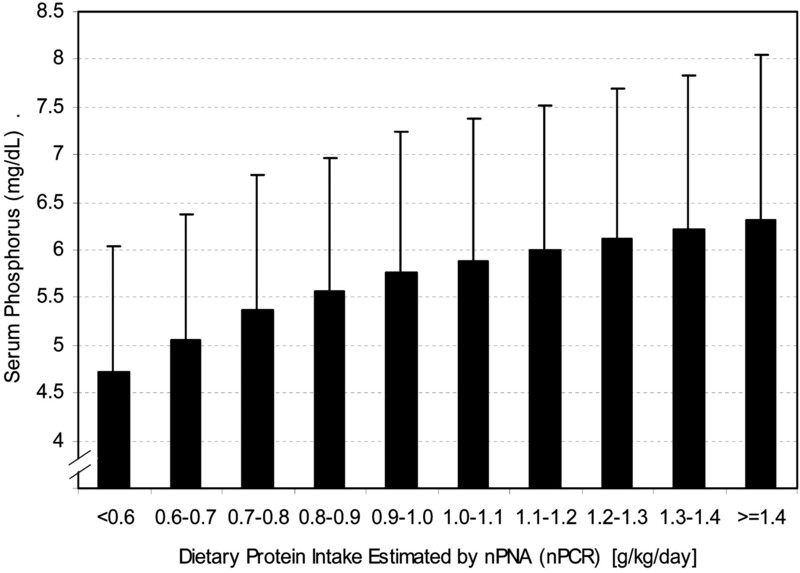 Association between the baseline dietary protein intake, represented by 13-week averaged nPNA (nPCR) and 13-week averaged serum P, in 30,075 DaVita MHD patients (P < 0.001 for trend). Adapted from reference (33), with permission. Mortality predictability of 3-month averaged predialysis serum P concentration in 30,075 DaVita MHD patients. The y axis shows the logarithm of the risk ratio of all-cause mortality during 3 years of observation (July 2001 through June 2004). The multivariable regression spline models are adjusted for case mix and measures of nutritional status and inflammation. Dashed lines are 95% point-wise confidence levels. Adapted from reference (33), with permission. 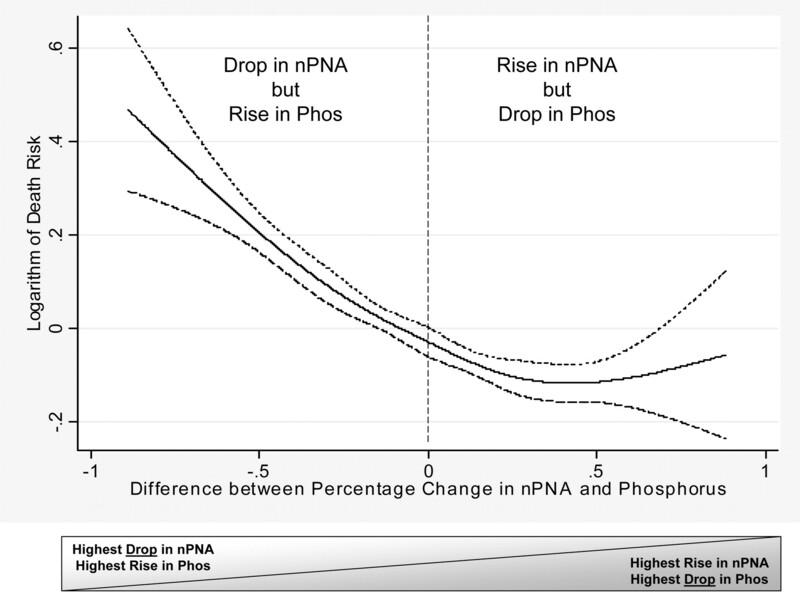 Mortality predictability of the difference of the percentiles of the changes in dietary protein intake, represented by nPNA (nPCR), and serum P concentration in 30,075 MHD patients. 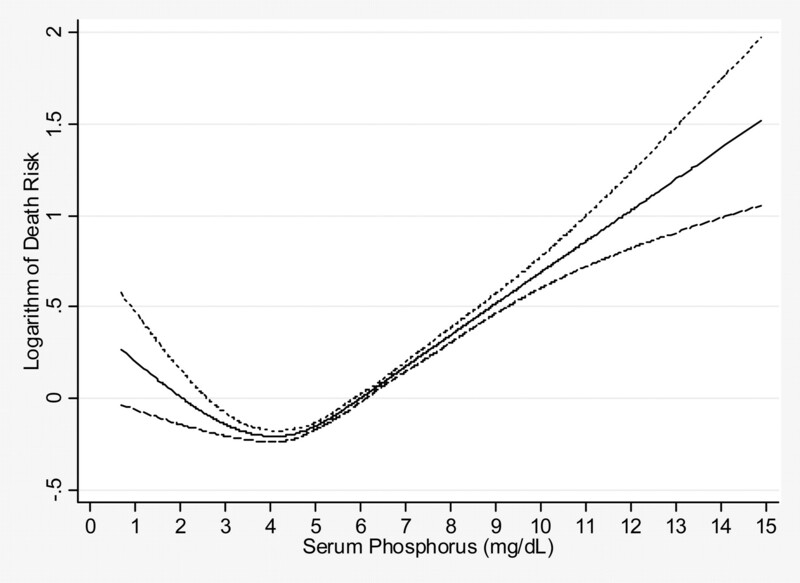 The difference between nPNA and serum P concentration in each patient is a number between −0.98 and 0.98. The y axis shows the logarithm of the risk ratio of all-cause mortality during 3 years on the basis of a multivariable Cox regression spline model, adjusted for case mix and measures of nutritional status and inflammation. Dashed lines are 95% point-wise confidence levels. Each patient received a percentile score between 0.01 and 0.99 according to the percentile rank of the change in nPNA or serum P. Adapted from reference (33), with permission. For more information on the nutrient content of foods, search the USDA food composition database. ↵a The quantitative sodium content is mentioned for high-sodium foods (>400 g of sodium per serving). ↵b P-to-protein ratio of egg varies considerably: Whole egg 13.4; egg yolk 24.7; egg white 1.4 mg/g. ↵c Values vary for cut of meat; average provided. ↵d Product contains phosphate additives (see text). ↵e P from nuts, seeds, and grains is ≤50% bioavailable than phosphorus from other sources (see text) (9). ↵f See also Table 4 for the role of additive in the variation of P content of various cheese types. Source: ICL Performance Products LP, St. Louis, MO 63141; http://www.perfperformancelp.com. Source: Company websites and personal communication with manufacturers. ↵a Most drinks have no P.
Variations in phosphorus contents reflect mostly the contribution of additives. Contents of the table were developed on the basis of personal communication with Dr. Martin Kuhlmann (Berlin, Germany). English translation of the German words: Käse, cheese; Weich, soft; Hart, hard; Schmelz, melt (Schmelzkäse usually referrers to “processed” soft cheese); Ecke, wedge; Fett i. Tr., fat in dry matter. ↵a There are different brands of processed soft cheese in the United States, such as Velveeta. ↵b For the processed soft cheese, the serving unit is 62.5 g (equivalent of 472 mg in 50 g of processed cheese).